What I miss from home. 1. The sun- I really miss the sun! All day, every day, there is a layer of both cloud and smog, meaning we rarely have a chance to see the sun. When it does appear, it’s great, and the sun is shining in my bedroom. Although it is cold at home at the moment, some days there is not a cloud in the sky and it is completely blue. Here, you mightn’t see the sun for 3 weeks straight. Although when the sun is out, the students get tired. I have no idea why. I ask ‘why are you all so tired?’ and they say ‘Because the weather is good’. God help them if they ever lived in Spain, they would get nothing done. 2. A cosy fire- we have no central heating, or fires. So to warm ourselves up, we usually put our air-conditioning on to 32degrees until its toasty warm in our bedrooms. In the office, my hands are literally freezing because we didn’t get the remote control to the air conditioner. I miss just sitting in front of the fire, drinking a lovely cup of tea, and watching a film. 3. Bread-Bread here is sickly sweet, so I don’t eat it. To me it’s not right to have sweet bread. I would love a chicken/salad sandwich. Or beans on toast, or just plain toast. 4. Milk- Again the milk isn’t nice, meaning I don’t drink it. That means I’m not getting enough calcium, so to rectify this, I buy the already made coffees with the milk in them. I know it’s probably just a tiny amount of milk, but it’s better than nothing. 5. Clothes- I miss my clothes from home! I didn’t bring a lot of clothes with me, so I have to keep re-wearing all of my clothes here. I can’t do a big wash then because I will have no clothes for the next few days, so I have to wait until its absolutely necessary to wash something. I also miss the ease of just browsing the shops, looking at different things. In Chengdu, 10 people work in a shop that in Ireland, they would only have 2 people working. That means everywhere you turn, there is an employee standing beside you and looking at you. This frustrates me, because to me, it feels as if they think I’m going to steal something. Also, many get paid on commission, meaning they are constantly coming over to you with different items or clothes, wanting you to buy them. 6. Typical western food- Although I like the Chinese food, it would be good not to have rice or noodles or pork every day. Maybe a steak, or a roast potato, or even spaghetti would be nice for a change. 7. Easily ordering food- At the moment, I am trying to learn Chinese characters, so I could hopefully order some food. A few days ago I was in a Chinese restaurant with my Chinese friend and I said I was learning Chinese characters. I said, jokingly ‘give me the menu and I’ll order the food’. So there I was looking at the menu, trying to figure out characters, until my Chinese friend took it away from me. He smiled and turned the menu the other way around. Yeah, I was reading the menu upside down. Not a great start! At least in Pizza Hut the menus are in English. 8. Understanding people- All I hear is Chinese, Chinese and more Chinese. It annoys me that I can’t understand them, meaning I miss out on what the students are saying. When they laugh, I have no idea what they are laughing at, so I just look at them with a blank face until they explain it to me. Even with my Chinese friends, they chat away together and I often wonder what they are talking about, resigned to the fact that I will never know. 9. My bedroom- At home, my bedroom was my haven, my place of relaxation. I could stick on some Friends, Father Ted, a good film. Here, my bedroom lacks cosiness, warmth, a personality. Although it has become ‘my bedroom’ in China, it will never beat my own back home. These are just some things I miss about home, I’ve managed it for the last 3 months, so even if I decide to stay for a year or even 2 months, I know that I can do without them. I never would have thought I’d be having a barbeque, in China…in November. But there you have it, a first! It was a little gathering with me, Charlotte and all of our teaching assistants. The Dean of the Department also made an appearance. Although we were a little daunted by this whole new experience, it actually was an enjoyable day! On Saturday morning, we left at 9:30am. This is a ridiculous time to go for a barbeque, but whatever the Dean says, it goes. The boot of the car was packed with food: beef, pork, fish, cabbage, potatoes…. The lot! For snacks, we had oranges, bananas and what we call ‘bird seeds’. Chinese people love eating peanuts and seeds (the seed is in the middle and you have to break it open with your teeth), we told them we give those seeds to the birds at home, which they laughed at. Typical, the weather wasn’t on our side. It was freezing, windy and there was a great chance of rain. Still, we headed to a ‘park’… meaning a golf resort. We set the chairs up in the freezing cold, got the barbeque ready and prepared the food. What turned out to be a bit of a terrible day actually turned out great! The food was lovely, we were chatting and having a laugh, and then we got to experience typical Chinese photography. We randomly met a couple of people who had fancy cameras with them, and they proceeded to take photos of us, telling us how to pose, move our heads, point to the sky. 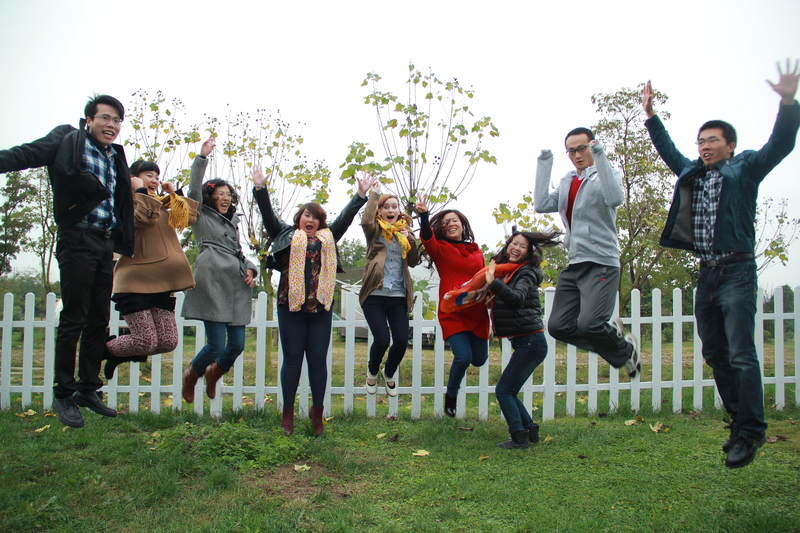 THEN, we had to do a typical Chinese photograph… jumping up in the air while the photographer takes the photos. All 10 of us jumping up in the air like eejits. The Chinese were loving it, obviously their years of practice made them naturals at it. Me and Charlotte however felt just a tad silly. This was our typical Chinese photo of us jumping. My assistant Jason, or as he says Jaason, also made me and Charlotte some calligraphy. He does it himself and I was really impressed. It was so nice of him! So after the barbeque, we headed back to the apartment to put the food away. Not even half the food got eaten. Then we decided to hit KTV. Although it was supposed to be all of the assistants going, only Amy and Liang could come, so it was just the 4 of us. I have to say, Chinese people actually sing very well. They can sing very high pitched, even the men! 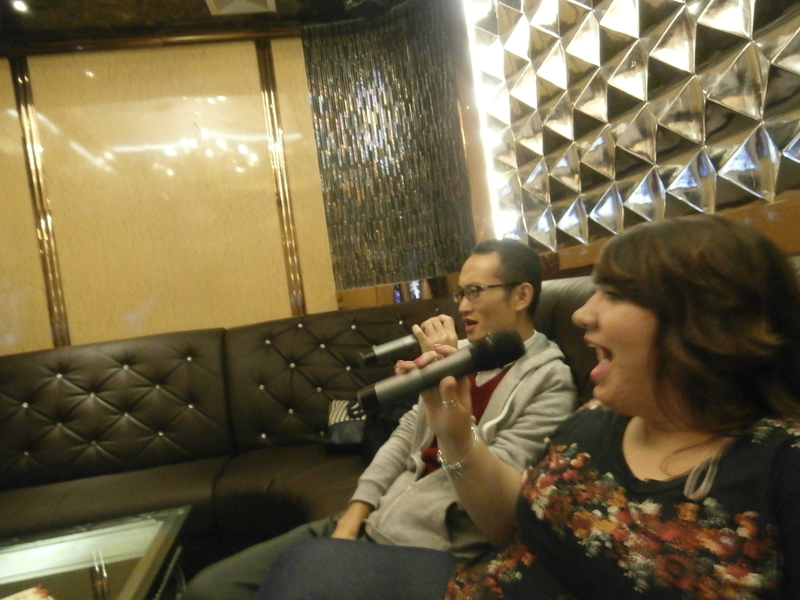 We ended up staying in KTV for 3 hours! We then headed back to the college and went to a Chinese place down the road for food. So the day actually turned out really well. I just hope they don’t decide to have another barbeque in December! Then on Sunday, me and Charlotte had a wee day out in Chengdu city. We hit Chunxi Road and I just went mad altogether, spending over 500yuan, or €50 on a dress, jeans and shoes. Now I have an excuse, I have no clothes, and I mean NO clothes, so I actually did need them. Then we went to a Chinese restaurant and actually got what we ordered! Although, we did ask for 12 potatoes, and we were given 4. On Friday we were in the city again and we opted for the easy Pizza Hut, so we HAD to get Chinese this time. We have no excuse really.We also treated ourselves to a Starbucks, where I got a Gingerbread coffee, it was lovely! I also notice a few shops have Christmas decorations which is a little strange, it also reminds me that I’m going to miss my first ever Christmas at home…. Why do electronics hate me? Why do electronics hate me? On Tuesday, I arrived in my classroom with my Elective Group, set up the computer and power-point, and proceeded to teach my lesson. I was showing them Tongue Twisters. (It was funny listening to the students try and say them) I was looking at my own computer and all I hear is ‘oh’. I look up and wonder what’s wrong, and they point to the screen on the wall. I look up and see that half of the screen is covered with a big grey square, covering half my power-point. So that was that, I couldn’t do the power-point. My assistant went downstairs to see if we could move to another class. So that was fine. ‘The computer will be fixed tomorrow, it will be fine’ was what I thought. So then I carried on with my week. Yesterday I arrived to class with my 1st years, switched on the computer, then proceeded to set up my lesson. So, I’m all ready, my students patiently waiting, until the computer freezes! There are 2 computer screens. 1 screen is mine, and the other screen allows me to connect my computer to all of my students so they can see my power-point. In this classroom each student has their own computer. So now my students couldn’t see anything. I started to get flustered now; I have 90 minutes to keep 48 students entertained without a computer. And typical, this all happens when I have no teaching assistant! In each class I have a teaching assistant who would translate what I have said to the students. To be totally honest, I would prefer not to have one. My Elective classes all understand me perfectly, so all my assistants do is sit and watch, so it’s really just the Required classes that I need assistants because their English is quite poor. So I asked my student Lidia (that’s how she spells it) could she go and find someone to try and fix it. I told my students to get into groups and each think of a word that rhymes with the previous word, like sat, mat, hat. There was no luck finding anyone, so 3 students got up to try and figure out what was wrong with it. One said, rather solemnly ‘teacher, it is broke’. Great. So I was resigned to the fact that I would have to think of activities for the remainder of the class. But suddenly, it worked! I have no idea what happened it but at least it worked! This actually happened me a few weeks ago with my other Required class. Typical, my assistant wasn’t in that day, and the computer wasn’t working. So there I was, wandering the classroom hallways with 2 of my students looking for somebody to help me. One boy arrived and said in Chinese that he couldn’t fix it. I rang my advisor; no answer. I then rang my other teaching assistant and said could he come up and help. He sounded groggy making me think he was asleep when I rang! So I talked to the students until he arrived, where after a few minutes he fixed the computer. I was so grateful and said to my students ‘Now say thank you to Liang for fixing the computer’. Ha all the students shouted ‘THANK YOU!! !’ I’m pretty sure he got a bit embarrassed, and as the Chinese say ‘lost face’. Back to my previous situation, for the remainder of the lesson I put on a video about Chengdu and its food. It’s called ‘Exploring China: A Culinary Adventure’ There are 4 parts to it, so I put on the Chengdu one and they loved it! A video is only meant to last a maximum of 15minutes, so after 15minutes, I paused it, asked them questions about it, then watched another 15 minutes. In one part, the people were eating pig’s brain. I asked the students ‘do all of you eat pigs brain?’ a collective ‘YES, IT IS DELICIOUS!’ rang out, and I was quite shocked! I didn’t expect them all of them to say they eat it. So after all that, the class went ok in the end. So I had my next lesson after lunch, in classroom 208, where my lesson on Tuesday had to be moved. I thought ‘there were other classes in here today, I’m sure it’s fixed’. WRONG. I set it up, was half way through an activity, then that dirty grey square arrived on the screen! So we had to move our classes again. Hopefully for next week it will be fixed! Our apartment isn’t even safe! 2 days ago, the water went off. Apparently a pipe broke. So no showers. I had to wash my hair over the sink, and I missed half the back of my hair, so one patch of hair is greasy while the rest is lovely and clean. Nice! And we aren’t getting it back until tomorrow. Then yesterday at 5, the ELECTRICITY went off. So at 6:30, I was getting ready in darkness for my class at 7. Pity it didn’t go off all over the college. Thankfully it came back at 10pm so at least we have electricity. I realise now how dependent we actually are on electricity. Now I can’t wait until the water is back, I can have a hot shower and wash ALL of my hair this time! My students have some very strange names! They don’t even have the excuse of picking them when they are younger, these guys are 18+. There is Onana, Babe, Gelinna, Siri (always reminds me of the iphone), YY, CC, Nony, Smiley, Wanna, Sherlock, SMALL BLACK. I have no idea where he picked that from! Then I have Dou Flamingo, apparently that’s a cartoon character. We have Pain, Summer-who is a boy, Castle, Crebo and Rose-who is also a boy. One girl must like Friday’s because her name is Friday. Then we have the numbers: Eleven, Seven and Sixteen. These are all in the same class. These are just some of the strange names that I have in my classes. But, they are unique, meaning these are the people I actually remember in the class! Oh, I also have Soldier, because he wants to be a Soldier. Every week, for 2 hours, we have Mandarin class. 2 hours a week is nowhere near enough time to confidently grasp the Chinese language, but our contract states we have to have 2 hours, so there you go! I do find it very interesting, and my advisor says my pronunciation is really good, which I am chuffed about. It’s just actually remembering the sentences, that’s the difficult part. The Chinese language is backwards to English. 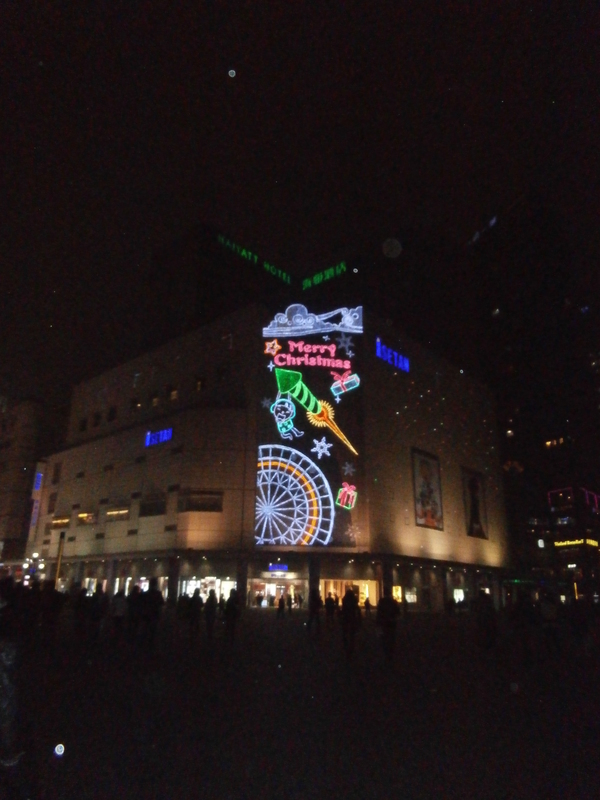 For example ‘shēng rÌ kuài lè’ means in Chinese ‘birthday happy’. ‘kuài lè’ means happy. So not only do you have to learn the pin yin, but you also have to remember the order of the words. When you are asking for the price of, say a t-shirt, you would have to say ‘t-shirt, how much?’ in Chinese. This, to foreigners would be bad English grammar, where we would say ‘how much is the/this t-shirt?’ instead. Irish is a little similar to Chinese, because a lot of the sentences are backwards. ‘You eat’ in Irish becomes ‘itheann tú’. In English, translated literally, it becomes ‘eat you’. (itheann: eat) (tú:you) My teaching companion is English so she found it really hard to understand how Chinese is backwards. From learning Irish, I understood it a lot more and just accepted it. Although I have been in China for over 2 months now, I still have very basic Chinese. I know the basic: hello, how are you, too dear, how much, I want to take-away, I want, no, yes, numbers 1-100, good morning, good night, potato, rice, meat. These are the basic sentences you need to know in Chinese to get by. When I listen to my Chinese friends, I understand WHO they are referring to when they are speaking. Wŏ: me, wŏ men: we all, nǐ: you, tā:he/she. So when they are saying tā I always wonder are they talking about me! But all is not lost. I’ve been noticing that I’m becoming a lot better at reading pinyin. At the beginning, I couldn’t pronounce any words, but now I’m reading them a lot more confidently, and getting most of them right too! At least one thing is improving! My Chinese students always ask me can I speak Chinese, and my answer is always no. Then to reassure me, they say ‘Chinese is very difficult to learn’ THANKS! If I’m hearing that from a NATIVE Chinese speaker then what hope do I have of ever learning it. But in fairness they do try and help me. Yesterday we were talking about Chinese food and they would tell me the Chinese word of it and I would repeat. They would clap and they’d be delighted that I said it correctly. In fairness though, I would know a lot more Chinese if I tried more. But after classes I just be exhausted and the last thing I want to do is learn Chinese. On the days I am working late, I finish work at 8:40pm and I’m in bed by 9:30pm. All the time, students say that their English is very bad. So then I have to keep reassuring them that they have good English, which many do. I keep telling them that they can have a conversation with me in English. They understand me, and I understand me…. That’s the most important thing. I say to them that my Chinese is so bad I wouldn’t be able to have a conversation with them in Chinese. There is a big difference between my 1st years and 3rd years. My 1st years English is quite limited. I wouldn’t be able to have a long discussion about the education system in China. It would be more basic discussions about what’s your favourite country and the like. This makes my life more difficult because my lesson plans have to be more structured. Most of my 3rd year students are good at English, where we would have different discussions about almost anything. I was the first native English speaker to arrive to this school, so I think they are beginning to understand they are well capable of speaking English when they speak with me. I say to them that they are very lucky they can speak 2 languages, and that I can only speak 1. Ha I’m actually jealous! So that’s why I want to push to learn Chinese, because I know it would help me in the future…. The only problem is, it’s gonna take a while. Ideer, Chiner, Energ and Or. No matter how much I correct my students, they still get basic vocabulary wrong. I often hear my students referring to China as ‘Chiner’. I don’t understand why they do this, it could be because ‘a’ is a vowel and it’s at the end of the word. This goes for the country ‘Russia’, where they will say ‘Russer’. ‘Clothes’ is another tricky word; constantly hearing them pronouncing the silent ‘e’. Another word I often here mispronounced is ‘Idea’. Chinese people will always say ‘Ideer’. I tested one of my Chinese friends, where I would say ‘Idea’ and ‘Ideer’… he thought I was saying ‘idea’ in both cases! Ha there is no hope! One student of mine drops the ‘y’ altogether from ‘energy’, where it now becomes ‘energ.’ It took me a while to figure out what he was actually talking about! Other sounds they have difficulty with are the ‘th’, ‘r’, ‘l’ and ‘v’ sounds. For example, they would say ‘Wolwo’ instead of ‘Volvo’. I have also had to change my speaking! For films, I now say movies. I also have to change my ‘r’. I pronounce ‘r’ like the word ‘or’. The students pronounce it like ‘are’. They would look at me puzzled when I say it my own way! I guess, when in China, do as the Chinese! I had my first Halloween away from home. So the theme for this week’s lesson was about Halloween! I have two different types of classes, 3 classes are Elective classes, where the students have chosen to study English and want to go to my class. These are 3rd year students, but I’ve had about 30 boys join one class and they are 1st year students. The other 2 classes are Required, meaning they are training to be flight attendants. Both of these are 1st years, so they are pretty wild. These HAVE to attend class because its, hence the name; required. That means I had a good week lesson planning wise, I used most of my material from the elective classes for required, having only to modify it to make it easier for the 1st years. I discussed its origins, showed them pictures of pumpkins, Halloween food, children in costumes, and showed my little nephew with his Vampire costume on him. All the classes went ‘ooohhhh he’s so cute and beautiful!’ They love when I show them pictures of my family, home or my friends. I showed them trailers from ‘The Shining’, ‘The Ring’ and ‘Halloween’, and asked them to look at how they make them scary. For one class, I veered off Halloween altogether and ended up talking about St Patrick’s day, and showing them pictures of parades and people wearing green. We talked about aliens, psychics and mediums in the same lesson. You honestly don’t know what you will end up discussing in the classes. I’ve also been invited out to a Chinese show. It was a show for the first year students, where they sang, danced and done Kung Fu. I saw some of my students on stage aswell. Me and Charlotte had ‘reserved’ seats… being brought to the chairs closest to the stage! The following Friday, we were invited once again to see a singing competition. I was brought to the top chairs, where we were told we have to vote for the best singer. I didn’t think I would be actually judging the singers! The Chinese absolutely love these types of shows. The room was huge, and loads of students were cheering, it was a great atmosphere. And we are not the only 2 foreign people in the area anymore! Four Belgium boys arrived last week and are staying in the teacher’s dorms with us. They are working in Volvo as part of their Master’s degree. Our college is in partnership with the company, meaning they stay with us. It’s been good to have Western people here, and the girls LOVE them. All I keep hearing is ‘they are sooo handsome’. The Chinese girls are extremely shy though, and they won’t go up and speak to them. Saying that, the boys here are also quite shy. Loads of times, I have walked past a group of boys, then when we have passed each other, they would say ‘HELLO’. I would have to turn around and shout hello back to them. For Halloween, the students union decided to have a little party. Me, Charlotte and the Belgium guys were all invited to this party, where it ended up being held outside in a basketball court. They had lights, Halloween pumpkins, chairs (where we were directed to sit, we were treated like VIP’s), a microphone, speakers, and music playing. (They were playing One Directions songs when we arrived, which I WASN’T impressed with) They gave out witches hats, sweets, a mask, and…. glow sticks! I laughed when they gave us glow sticks, of all things! The party went like this: they literally forced Charlotte to sing, but she was having none of it. They then moved onto me and, without any luck, tried to make me sing a song. I had to use the ‘I have a cold, cough cough) tactic. Although it actually is true, I was dying the previous days with it. They then targeted the Belgiums. Up they went, put on the lyrics, and sang a Dutch song. The music was off from the lyrics, meaning they kind of butchered it… but the Chinese still enjoyed it! After that, we were hounded with Chinese students. I mean HOUNDED. Everywhere you turned there were students taking pictures, wanting pictures, queuing for pictures. ‘Can I take a picture with you?’ was asked about 30 times. You couldn’t get away from them! It honestly felt like I was famous. I think that’s the closest feeling I’m going to get being famous. So if you wanna be famous…go to China. I then ended up agreeing to play ‘musical chair’s’. Now I haven’t played musical chairs since I was a child. And I ended up being placed with all boys! So there I was, running around 6 chairs with 7 Chinese boys, with some of my students looking and laughing, well at least they know I can have a laugh! I only lasted 1 turn, then I was sprayed with this white spray; ruining my curled hair especially done for the party! Soon after, we decided to head, us foreigner s needed food! We managed to sneak away where we met one of my students, and he decided to come with us for food outside the college. We had a few drinks and had a Chinese barbeque. We didn’t get back until 12am, and my student’s curfew is supposed to be at 10…. In my eyes, at 21 he’s a grown up, so he can do what he pleases! MMmmm I wonder what they have planned for us at Christmas? Well let’s just say, I won’t be surprised if we get Glow Sticks again.